The William E. Rawls Prize is given to a young investigator whose work has led to important advances in cancer control within the past decade. Dr. Rawls served on numerous committees and advisory groups of the former National Cancer Institute of Canada and was elected president in 1986. His research focused on viruses, particularly those involved in chronic diseases and cervical cancer. This prize comes with $1,000 for the recipient and $20,000 for their research. 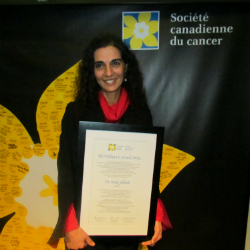 Dr. Nada Jabado is an international leader in the field of pediatric brain cancers. As an oncologist and geneticist specializing in pediatric cancer, her research and clinical work has been dedicated to the understanding and treatment of brain cancers in children. Her recent research has opened a totally new genetic profiling approach in the predicted outcome and future management of these children. Dr. Jabado is a hematologist, oncologist and researcher at the McGill University Health Centre Montreal Children’s Hospital. She is also an associate professor, department of pediatrics and an associate member, department of medicine, division of experimental medicine at McGill University. Since establishing her own laboratory in 2003, Dr. Jabado has published more than 30 papers. In addition to her scientific successes, Dr. Jabado is a caring physician and a remarkable clinician scientist dedicated to understanding one of the most dreadful pediatric cancers. Her work has accelerated potential treatments and new therapeutic regimes that promise to make a great difference in the lives of these children with cancer. * Please note: not all previous recipients of the William E. Rawls Prize were considered under the current criteria. In 2000, the terms of reference for this award were changed significantly with the establishment of the Terry Fox Young Investigator Award. In 2007, “cancer control” was more fully defined to include clinical, epidemiological, behavioural, psychosocial, population-based research or similarly-applied research, and does NOT include research in the basic biomedical sciences.